Here are a few of the teams that reliable solo the Pit Raid. There are many other possible combinations between the above teams. Subbing in Yolo for high damage in the later phases if you have him geared up is also possible with most of the above teams. CLS may be your MVP, but until he can solo the whole thing, don't slack on Rex' and FOO's mods. Furthermore, yur speed sets still need good secondary stats to be good. Otherwise use health sets or whatever with good speed stats instead. Also play on manual at first. In addition to Vendi's advice: Only use Rex' basic and buff. Not his special attack. I actually DO believe, you can solo it with g8 CLS if you mod your team well and play on manual. Oh, and a zeta on IBAT is strong - not only in raids. 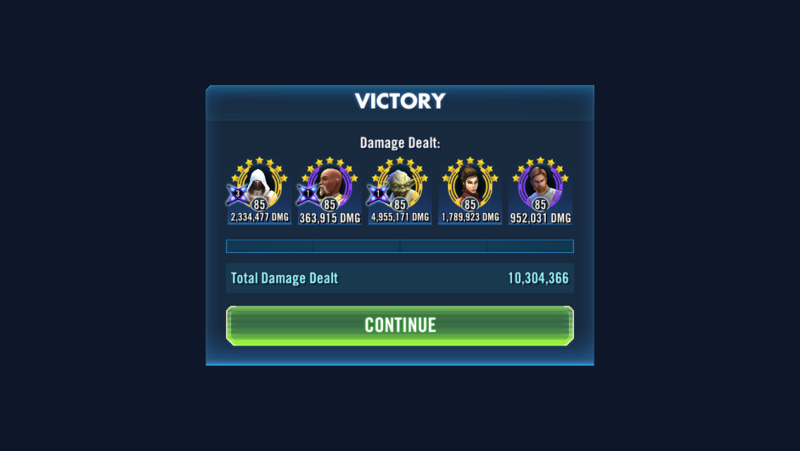 FO - zKRU with Phasma/Kylo, FOO, FOE, FOST can solo it easily at about G9, auto after about g10-11. NS - if Spirit is one of the 5 it's insanely easy to solo with a full NS squad as she removes 20% TM on basic along with the TMR from Asajj lead. You need to be faster. The square and circle on cls doesn't have any secondary speed speed. No speed arrow on rex and 4 of the non arrow mods have zero secondary speed. No speed arrow on FOO and only 3 mods with any secondary speed. So step 1 make everyone faster. Step 2 find another character to help speed your TMR up and help heal. I'm talking about hermit yoda. He can give masters training to cls and rex and call them for assists which means more tmr. He can also use a team heal technique. OP only has those three currently. He will take CLS to g10 and solo the whole thing auto before he gets another TM reducer to rank 7. Ok, I'm on to putting mods on with Good speed secondaries. Thanks yall! I specifically mentioned hermit yoda as my suggestion for a 4th. Masters training calling cls and rex to assist and healing to keep people alive. Yes, you did. And OP will be able to solo it without HY far earlier than he will be able to have HY available to join the team. So Last T6 Pit raid, I could solo the two middle phases, although the Rancor did get a few hits (never used devour, lucky right?) I never got a chance for the first phase and My characters were still a bit slow for the last Phase. I used CLS and Rex and today I just Got both of there speed up a bit today, you can see it below, however it probs wont update till tonight. Ok guys, I just did the HPit raid and I was the top contributor! Thank you for all of your help! I couldnt have dont it without you all! Oh and BTW, I could have probs soloed the forst 3 phases with just CLS Thanks Waqui! I just used Rex lead, and CLS and it was awesome! ...takes about 10 mins on 4x speed and full auto iirc. Very fun to use for first time Revan users. zAsajj, Zombie, Spirit plus two other NS can easily solo it. Her zeta leadership TMR is the exact same as Vader's, Zombie brings Tenacity Down and a fast Spirit removes 20% TM on her basic every time. It'll be my next solo goal. Add to the list. I just try to do fun runs from now on. Easily soloable with ZKru (G11), FOE (G11), FOO G11), Kylo (G9) and Phasma (G8) on autoplay. Also G10 is enough on auto. Probably the most economical way to do it. Omegas of course, but Phasma doesn't need all of hers. I'll add that once maxed you can auto it with that team and the Rancor won't take any turns in any phase if you're fast enough.